Cold weather is starting to creep around the corner. What a perfect time to pullout our favorite jackets and boots or even our “can’t-live-without” oversized sweater. It is super early and about 49 degrees out. I am sitting on my couch watching the latest Fashion Police with my silver and black oversized sweater, thigh high cotton socks, shorts and a t-shirt. I couldn’t help but share my all-time need-to-know beauty tips before heading out to my early morning photoshoot in DC. I hope this will inspire you to spruce it up, change it up and dare to be effortlessly fearless. Makeup Tip # 1: Strong eye shadow is best suited to on a natural, flawless face and completely bare lips. Skip the mascara and allow the colors to pop on their own. Makeup Tip #2: Apply black shadow over your eyeliner to help keep it on all night long. Makeup Tip #3: Have freckles? Don’t hide what makes you, you! Add a thin natural base to help enhance them. Makeup Tip #4: Boost your contours by shading! Apply brown blush underneath the cheekbones for definition. Makeup Tip #5: Express your sensual side by wearing pale blue shadow with red lips. Makeup Tip #6: For a unique and spectacular lip look, use a dark purple lip pencil around the contours of the lip, continue with a brighter purple, and finish with a hot pink color placed in the center of your lips. Makeup Tip #7: Mix usage… Blushes can be used as shadow and vice versa. Makeup Tip #8: For a modern dramatic look, combine a bold eye color with a deep dark lip. 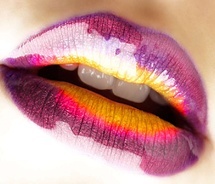 Makeup Tip #9: Make your own couture lip color by mixing your favorite shadow with a clear lip gloss or Vaseline. Makeup Tip #10: Brighten tired eyes with a crème or white pencil. Apply to the inner rim of your eye. For a more reflective effect find a liner with a little shimmer built in. …was jus about to say that! i kid…thanks Anna! Always interesting. Besos backatcha!